The Calculator is a life savor in a lot of ways, but be careful when using the dry oz function. The default setting is 8 1/3 oz which converts to 236.6 grams This can be a big problem. If your Recipe calls for a 1 cup of flour the correct weight is 4 1/2 oz which converts to 127.6 grams. USDA weight per 1 cup of flour = 125 gram, so there is some wiggle room. I'am giving this a 4 star ratting due to the dry oz to grams issue. I bought one of these back sometime around 2003. I loved it. It worked wonderfully and only required one battery change in almost 10 years! But then it finally died but I got more than my money's worth out of it. 6 months ago I ordered another one. It looked the same but I noticed that the alarm was much quieter and the LCD display would dim when I turned one of the timers on. After a week or so, the display became so dim it was unreadable. I thought perhaps the battery was bad so I replaced it. It helped a bit but within another week it was unusable again. Giving the Calculated Industries the benefit of the doubt - manufacturing errors can occur - I threw the 2nd one away and ordered a new one. The new one is working somewhat better but the display still dims when a timer is turned on and the alarms are barely audible. One manufacturing error is a mistake, two are a pattern. At least the battery isn't draining on a weekly basis. Pros: Dual timers are incredibly useful for cooking. The big display (when readable) is great when you're in a hurry. The conversion and scaling features are immensely valuable if you cook for two but only find recipes for 4 or more. Cons: Manufacturing and quality control have gone downhill. Alarms are inaudible around any kind of noise (fans, TV, talking). The display dims when keys are pressed and stay dim when timers are activated. Overall: I still use it because I haven't found any other dedicated device with such a nice set of features. So, two stars for good design but poor execution. There are apps for iOS and Android that can be used on smartphones and tablets but these aren't ideal in a kitchen where they can be contaminated by liquids and foods on the fingers. Plus, the apps close when the device sleeps and it's annoying to have to keep entering the wake-up code to deal with the timers. 5,0 sur 5 étoilesAwesome product. This tool is a awesome. IT's not easy converting recipes on the fly. This device allows that and can even switch between measurements after the conversion. Say you get 3/4th cup and divide it by 6 to 1 conversion. Most people don't have a 1/8 cup so clicking tbsp converts it into two tablespoon cling it again will turn it into a decimal fraction and back. If you want to click teaspoon again it'll say 6 teaspoon. All this can be done in seconds. I haven't used the timer or other features I bought it for the serving conversion. 5,0 sur 5 étoilesKitchenCalc is beyond helpful! I saw this calculator as a deal, and I didn't understand why the original price was expensive. Then, I was a little skeptical and didn't know if I needed it, I figured I could just continue converting online or on a normal calculator. I WAS SO WRONG! I am so happy I bought this, especially in time for Christmas baking. I use it all the time in the kitchen, and sometimes for other circumstances. I felt like a nerd, but I did read the little manual that comes with it, because I was a little confused and there is a lot of helpful information in there. 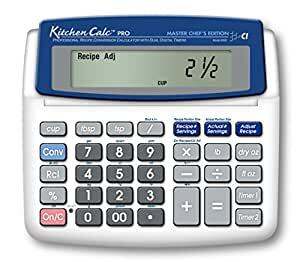 This calculator can truly do so much and I highly, highly recommend it to anyone who ever needs to convert recipes or get teaspoons to cups, or whatever! If you BAKE, you NEED this product. I convert everything to grams so it is particularly useful. Even without that it is a great product for dividing and multiplying ingredients. I just made 20 blackberry pies, how many packages of berries do I need. Each pie needs 360 grams (360 x 20 = 7200), touch [convert] touch [gram]. The grocery store sells in 18 oz packages. touch [convert] touch [dryoz] (254 oz) divide by 18 oz touch [divide symbol]  and I need to buy 14 1/8 boxes. Any kitchen calculations you need are there. converting tablespoons to cups, grams to ounces, etc. I love it so much, I was scared that I couldn't function if it quit working on my one day, so I now have a backup which I keep by my computer and the other one in the kitchen.